Kal Bhairav is an incarnation of Lord Shiva and in this form, he is believed to have cut the fifth the head of Brahma. Bhairav is worshipped mainly in two forms Mahakal Bhairav and Batuk Bhairav. Here is a simple guide to performing Kal Bhairav Puja. 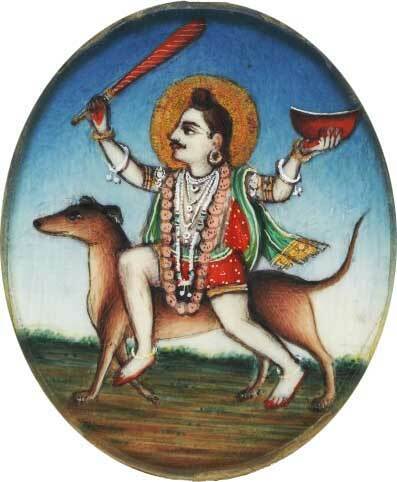 He is mainly worshipped on Kalashtami day. This puja guide is only to give an idea and you can always be flexible with the rituals or be more elaborative. It is believed that it is quite easy to please Mahakal Bhairava and the devotees are blessed with boons and their wishes are fulfilled. When to Perform Kal Bhairav Puja? On Kalashtami, the eighth day after the full moon day in a lunar calendar is considered the most auspicious day to perform Bhairava Puja. Benefits of Kal Bhairav Puja? Mental peace will be achieved. Good puja for retaining and making wealth. Peace and prosperity in the family. The puja is performed in the evening, during Pradosh period. Preferred direction is southeast. After purification rituals (cleaning house, bathing etc) a painting or idol or photo of Bhairav is installed in the puja area. It should be placed on a white color cloth. Some people also keep a Bhairav Yantra. Lord Ganesha is remembered first and prayers are offered to him. A shloka dedicated to Ganesh is chanted. The lamp lit on the day should have four wicks. Mustard oil should be used. Panchopchar Vidhi is followed in Bhairav Puja. Panchopchar puja involves offering – Akshata (unbroken rice mixed with turmeric), dhoop (incense), diya (lamp), flowers, prasad or naivaidya (food). Tilak should be of chandan. White flowers should be offered. Kaner (oleander) flower is preferred. The Prasad offered to Bhairav is black urad dal Vada fried in mustard seed oil. If not possible then you can offer white kheer. The prayer that is read out, in the end, is the Shri Bhairav Stuti or Bhairav Chalisa. Feeding dogs on the day are considered highly meritorious.